Engr. 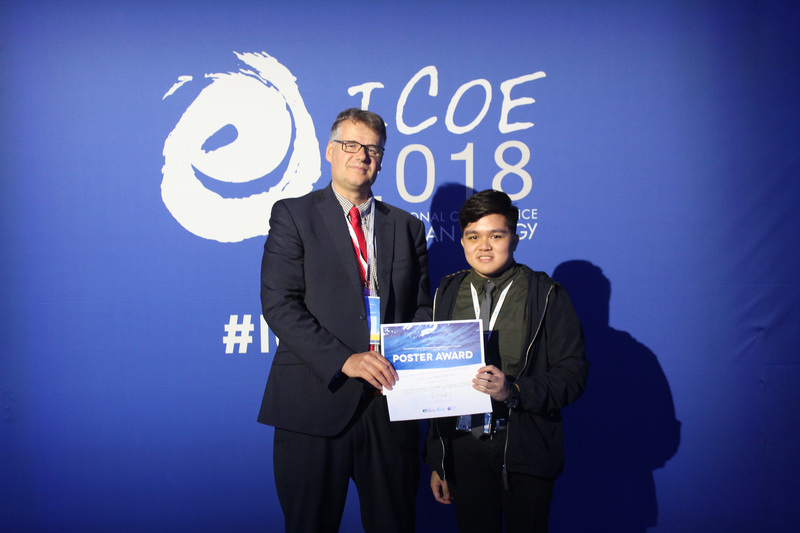 Niño Jhim Andrew B. Dela Luna (right) receives the Poster Award – First Place certificate – from Mr. Henry Jeffrey, chairman of Ocean Energy Systems (OES) and co-chair of ICOE, during the awarding ceremony at La Cité de la Mer in Cherbourg, France last June 14, 2018. Mapúa University Master of Science in Mechanical Engineering graduate Engr. Niño Jhim Andrew B. Dela Luna, 23, had a constant view of the sea from his hometown in Lemery, Batangas. He watched the movement of the water and how the tide came in and out, everything denoting grace, power, and regularity. This is part of what inspired his master’s thesis on tidal energy, which won first prize for the Poster Award in the International Conference on Ocean Energy (ICOE) this year in Normandy, France. Dela Luna’s thesis was selected among 68 other studies on ocean energy presented for the Poster Awards. The prize included a €1,500 grant, sponsored by Ocean Energy Systems (OES), a collaborative intergovernmental program based in France. He attended the OES conference from June 12 to 14. Ocean energy is a branch of renewable energy that relies on harnessing the natural power of the ocean through waves, tides, thermal energy, and the like. The International Conference on Ocean Energy is held every two years and is attended by the leading minds in the field, as well as researchers and members of the burgeoning industry. Dela Luna’s thesis, entitled “Tidal Resource Assessment and Hydrodynamic Simulation of a SeaGen-Type Horizontal Axis Tidal Turbine in Verde Island Passage Philippines”, presented a theoretical application of a tidal turbine in the Verde Island passage, based on numerical modelling of tidal currents in the passage and a simulation of the tidal turbine representation during the peak month for tidal energy harvesting. It occurred to Dela Luna to submit his thesis for the ICOE after finding references for his thesis, seeing that a paper he cited was presented at the conference. “I finished my thesis just in time for the submission,” Dela Luna recalled. “I didn’t even know that it was a competition. I was just proud to share my study at such a prestigious conference.” He added that his thesis went up against studies that were adapted from his peers’ dissertations, which made his win even more unexpected. Dela Luna credited his years in Mapúa University for setting him on the path to developing his thesis. He briefly encountered renewable energy in his undergraduate studies, leading to his interest in ocean energy technology. Mapúa’s capable faculty also played a major part in the creation of his winning thesis. “My thesis adviser Dr. Mark Christian Manuel, helped me ground my research to make it more feasible,” Dela Luna said. “He, along with my thesis panel members, also provided valuable inputs which helped improve my study.” His other mentor, Dr. Dante Silva, taught his masters Research class and oversaw his initial research on tidal energy. For the Mapúan, his training in the University has taught him the important values and disciplines to work effectively in his chosen profession. “The culture here in Mapúa is very competitive and fast-paced. You learn to manage your time better and work under pressure,” said Dela Luna. Dela Luna also took his bachelor’s degree in Mapúa. He was the president of the student council for the School of Mechanical and Manufacturing Engineering during his undergraduate studies. Dela Luna currently works at Mapúa University as a Science Research Specialist II, with a project on unmanned aerial vehicles funded by the Commission on Higher Education (CHED), through the Discovery-Applied Research and Extension for Trans/Inter-disciplinary Opportunities (DARE TO) Research Grant. He plans to work more on renewable ocean energy in the future.